A few months ago, the Internet was buzzing about an experimental particle physics paper that broke the world record for having the most contributors. Having that many people contribute to a project without it spiraling out of control is surely a testament of human perseverance. While the field of particle physics is no stranger to ‘kilo-authors’, it is a fact that in all areas of study the process of writing papers has become increasingly collaborative. As a result, researchers are constantly on the look out for simple and intuitive solutions that reduce both time and cost in bringing people together to work on groundbreaking ideas. In the field of collaborative writing, Google Docs stands a matchless contender with its real-time cloud processing and auto-save functionality. That is why, at colwiz, we worked hard to extend the functionality of Google Docs to facilitate researchers as they collaborate with peers on writing grant proposals, literature reviews and research papers. colwiz has now perfected a robust citation manager for Google Docs in the colwiz Research Companion (chrome extension), so that authors can stay laser focused on their paper without bothering about citations. As you open a Google Document with the colwiz Research Companion installed, you’ll find the colwiz menu sitting comfortably amongst your standard menu items on the top. In here, you and your co-authors can add citations quickly from your personal or shared colwiz library, or even from an online search while you write. With a single click, you can create a bibliography for your document and auto-format the references in one of over 7,000 pre-viewable citation styles. 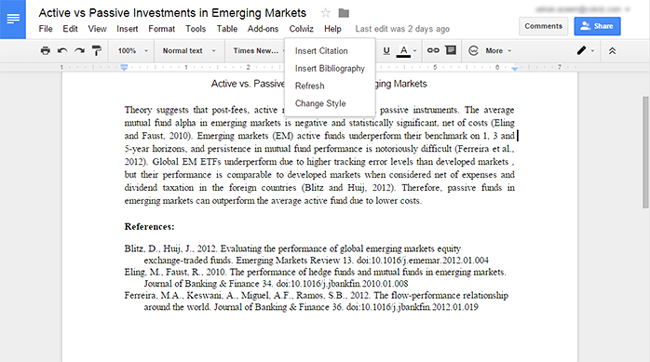 Citations are editable as well so you can quickly remove or add the papers you want to cite. The user experience has been carefully designed to blend in with the Google Docs suite, so that referencing seems as natural as reading or writing online. With the inclusion of the Google Docs citation manager, the extension is now a fully equipped research companion – facilitating you from the initial stage of article discovery, through the reading and brainstorming phase, down to the final stage of writing the paper. Never again will you or your colleagues need to resort to multiple conflicting plugins or (heaven forbid) manually writing each citation while working together on your next big thing. Can’t wait to get started? Install the colwiz Research Companion from the Chrome Extensions store here. Let us know your thoughts on this experience. Be sure to get in touch with us at support@colwiz.com for any bug reports or feature requests. We look forward to hearing from you! Want to learn more about citing with colwiz in Google Docs? Read all about it here.